A new distance record for me. The same strong tailwind that I have been enjoying for the past four days continued to blow hard. A generally downhill morning and flat afternoon helped also. The internal conflict scars all too evident throughout the country. 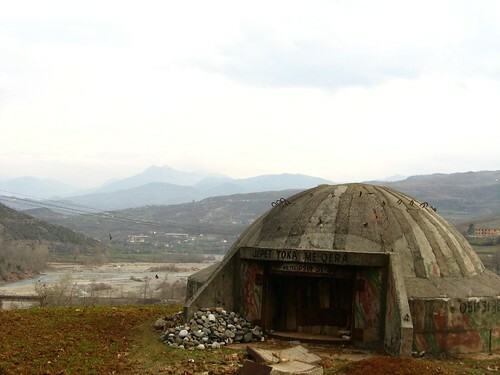 This bunker was near Elbasan. The road from Elbasan to Durres snakes through rocky mountains. The road is smooth, and the traffic light. An absence of a shoulder makes a cyclist uneasy however, as most of the Albanian drivers seem to have only received their drivers’ license recently. Much less room is given, certainly less than in Greece. In general, Albania is an ecological disaster zone. Truck loads of garbage is dumped into rivers, due to an apparent mindset that says that a good high water will wash it all away. The thing is that often the river is so clogged up that water flow is non-existent. The photo below shows one of the tamer situations in Durres. The people however continued to be very friendly and generous. I was looking out for somewhere to buy bread, when I saw a bread delivery truck outside a cafe. I pulled up, and asked the driver if I could buy some bread from them. The driver got out and handed me five bread rolls, and wouldn’t take any money for them. Jolly nice chap. Towards the end of the day, the road changed direction, so that I was now cycling against a strong side wind. The road passed through a very flat, open part of the country, with few options for sleeping spots. I asked at a hotel how much they charged for a room. 20 Euros. I was tempted, since it was still very windy. But sleeping in a hotel on your own is no fun. I carried on into the dusk. In the end, under cover of darkness, I pushed the bike into a field, and found shelter from the wind behind some thick boysenberry bushes. I slept like a log, shattered after the long day, hoping and praying that the wind wouldn’t bring rain through the night. You seem to have really been cruising along the past couple of days. At this rate you may end up in England by April. Just watch out for those packs of dogs. Oh, and the stove is looking good too. You are a regular boyscout.